Robert Frost once said “Good fences make good neighbors.” He was absolutely correct; the better defined the boundaries, the easier it is to get along. However, there are times when border crossings become extremely attractive and even critical to survival – such as when you’re home alone with a toddler during a hurricane, or when it’s been sweltering hot for days and on the other side of the fence there is a sparkling pool. Fortunately for me and Leandro, our next-door neighbors have come through in the clutch on just such occasions. We spent a hurricane with them as well as a couple of heat wave days and not only were they lifesavers, but they were totally fun. So it was time to show our appreciation. And what better way than to pass several gallons of several varieties of refreshing home-made sangría over the fence for an impromptu sangría-tasting pool party? We did just that a couple of days ago, serving the sangría in honking big pickle jars (I was inspired to use them by a recent wedding in New Paltz that I’ll be blogging about soon, but the observant reader will quickly surmise that I have a lot of empty pickling jars because I haven’t been on the Ball about preserving and pickling this year…). Each of the following three varieties had its fans among the tasters. My personal fave was the Pimm’s blend (Hail Brittannia), Allen and Lynne liked the tartness of the cranberry blend and Alyssa and Barbara demolished the white wine and Limoncello. Big plus about neighborly imbibing? No driving involved! But I knew I had really made the grade when the college kids started sending instagrams of their drinks to their friends from their smart phones! A couple of said friends actually turned up at the house, having abandoned their barstools where they were actually spending their own money on sangría that was apparently not as good…. In a large bowl or two pitchers, mix wine, juice, Pimms and sugar. Add fruit and refrigerate for several hours or overnight. When ready to serve, top with ginger ale or seltzer, or let each individual top off their cup with their choice of fizzy drink. Use loads of ice!!! Mix everything except the orange and lemon slices and fizzy drink in a large bowl or pitcher. Add fruit, refrigerate for several hours or overnight. When ready to serve, top with ginger ale or seltzer, or let each individual top off their cup with their choice of fizzy drink. Use loads of ice…in the glasses. Mix everything except the fruit slices and fizzy drink in a large bowl or pitcher. Add fruit, refrigerate for several hours or overnight. When ready to serve, top with ginger ale or seltzer, or let each individual top off their cup with their choice of fizzy drink. Pour over ice! Mmmm, one of my favorite go-to drinks for parties. Lovely! 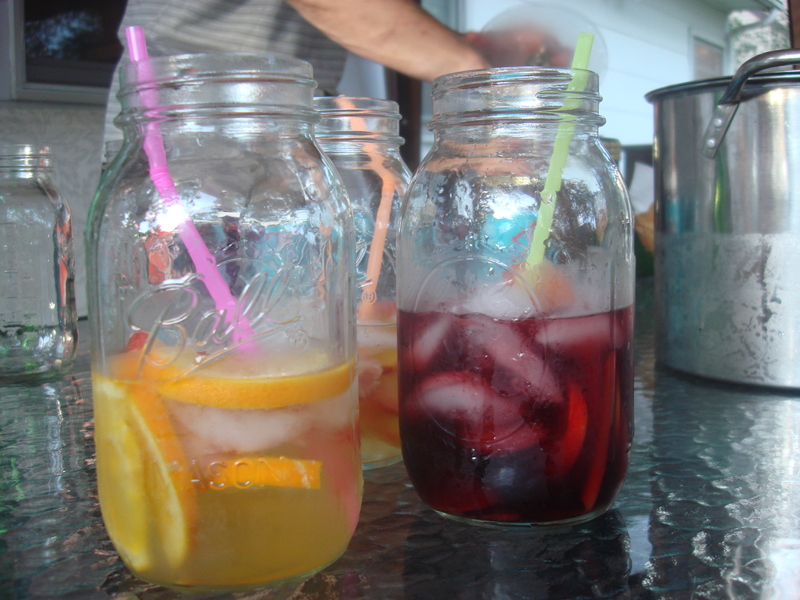 I love the idea of three different sangrias. Something for everyone! 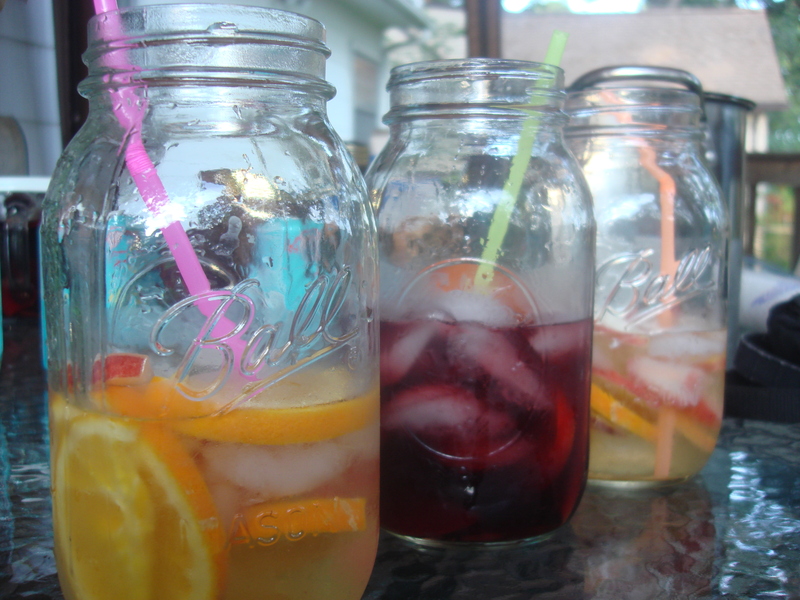 A sangria tasting around a pool sounds like a “cool” day. It is wonderful to have nice neighbors. Thanks for the salute to team GB! 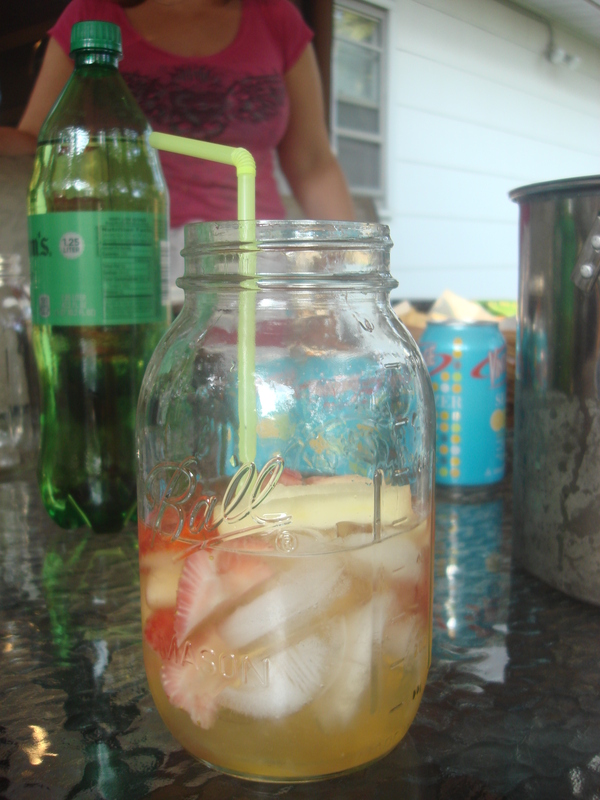 Great recipes and I love your jars – will we see moonshine next? I think I’ll leave booze-making to the experts…and I’ll just keep accessorizing! Sangria is my absolute favorite adult beverage 🙂 Can’t wait to try these new concoctions! The best way to enjoy wine in the summer heat! Yum! 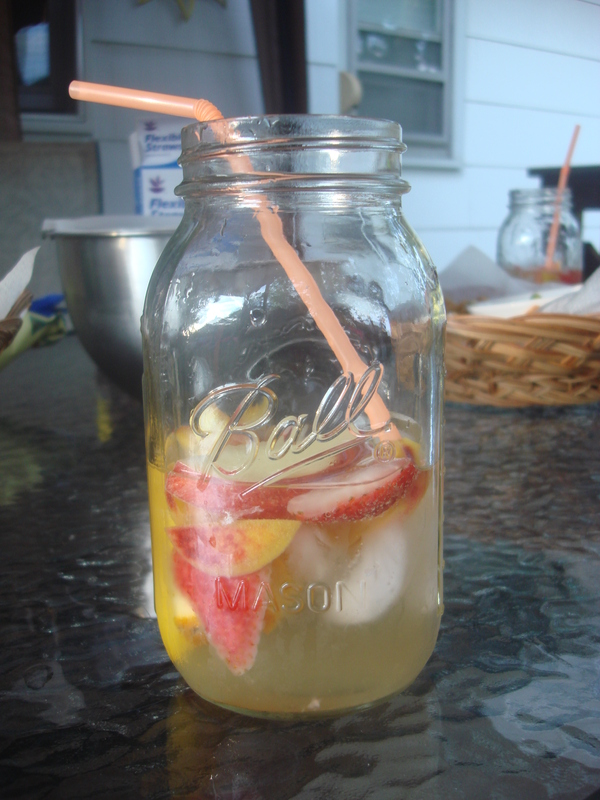 Love trying new sangria recipes. Thanks for sharing! Thanks Dierdre! I love recipes that let me put wine over ice with no shame!! !